Prototype: 2 different Swiss Federal Railways (SBB/CFF/FFS) class Ae 6/6 electric locomotives. One in a fir green paint scheme as the "Zürich" canton locomotive, road number 11412, with raised decorative stripes, as the locomotive looked at the end of the Fifties. One in a fire red paint scheme as the "Stadt Basel" canton locomotive, road number 11410, with raised decorative stripes, as the locomotive looked at the end of the Eighties. Model: This is a new edition of a Märklin classic based on item number 3050. Both locomotives have mfx digital decoders. Each locomotive has controlled high-efficiency propulsion. Each locomotive has 3 axles powered in a truck. Traction tires. The triple headlights change over with the direction of travel, will work in conventional operation, and can be controlled digitally. The locomotive bodies and frames are constructed of metal. Both locomotives have coupler hooks. Both locomotives are individually packaged and marked. They also come in a master package. The packaging has a colored representation of the locomotive borrowed from the historic packaging for the Ae 6/6. Length over the buffers for each locomotive 20.3 cm / 8". The fir green locomotive goes well with the "tin-plate" passenger cars in the 40661 set. 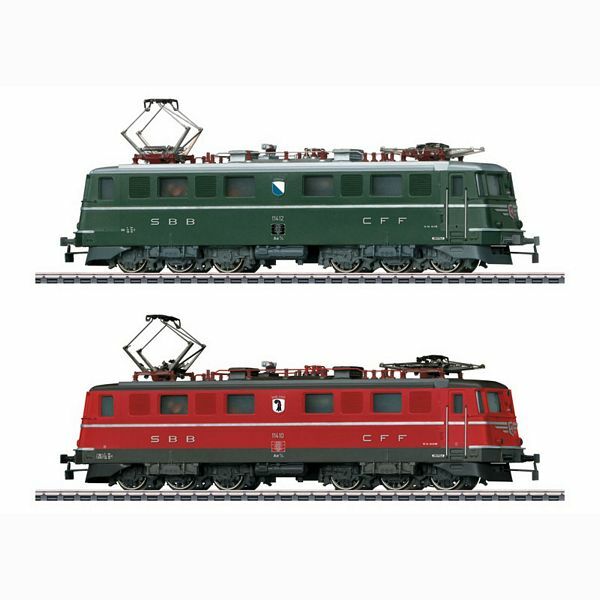 Each locomotive individually packaged with colored representation of the locomotive borrowing from the historic packaging for the Ae 6/6.